I’ve been working with Fran Millican-Slater again on the next incarnation of Stories To Tell In The Middle Of The Night. I designed the sound for the original stage show which was commissioned by Birmingham REP in 2016. This collection of short stories, framed with a radio raconteur aesthetic, lends itself perfectly to a podcast. All the stories from the show have been included along with many more in this expanded collection that spans nine 30 minute episodes. The original sound design transferred well to the podcast and I took the same approach with the rest of the stories. Real world sonic references – music, environments, sound effects – are combined and transformed to reflect the humour, unease, violence, and peculiar scenarios the stories evoke. You can listen to episode 1 which was released on 22 May 2018 here. The remaining 8 episodes will be released weekly. 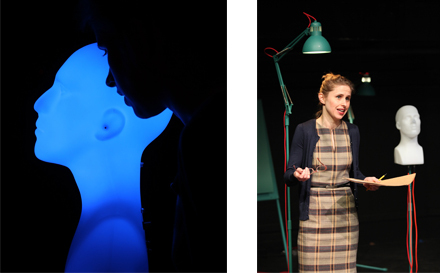 I’ve recently completed work on the sound design for a piece of new theatre Heartbeats & Algorithms. 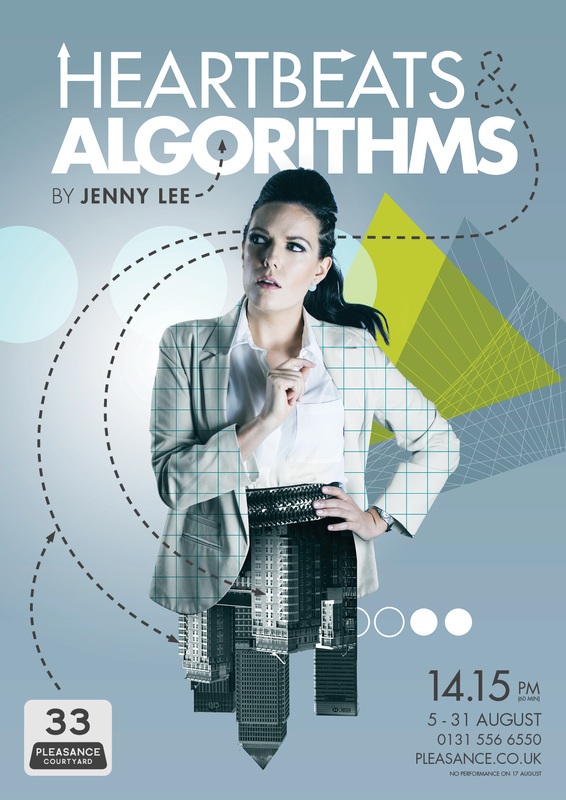 Written and performed by Jenny Lee, this one woman play tells the story of Banks, a programmer who develops an algorithm that can predict the decisions people will make. Director Valentina Ceschi (Dancing Brick) has opted for very minimal staging with no set and simple lighting that focuses attention on the character, her story and the sound which plays a significant role in supporting the narrative. The sound design consists of ambient sounds signifying the various settings in the story both literal, such as and office and a tube station, and the abstract, virtual space of an online forum. I also created a sonic representation of the algorithm that haunts the narrator using coil pick up recordings of computers and other electronic devices. Following a successful preview at the Kings Head Theatre in Islington on 27.07.15 the show will run for the month of August at Pleasance This at the Edinburgh Fringe. Find out more on the Heartbeats & Algorithms website where you can book tickets and follow Banks on Instagram. KILN’s production of A Journey Round My Skull has a few performance dates in the next couple of months. I produced the sound design for the production which had a successful run at the Edinburgh Fringe last summer. You can read more about the show, hear some sound and watch a trailer here. I recently finished work on the sound design for A Journey Round My Skull by Kindle Theatre. This project has been in development for the last year and is inspired by the extraordinary medical memoir written by Hungarian satirist Frigyes Karinthy. The memoir presents the author’s account of his diagnosis with a brain tumour and its subsequent removal during awake brain surgery. In collaboration with writer Nick Walker, Olivia Winteringham has adapted this memoir into a one woman show in which the tumour and its surgical removal become a metaphor for the lengths one might go to to eradicate painful or embarrassing memories. Frigyes experienced aural hallucinations as a symptom of his condition and we have developed this as a central idea in the work. 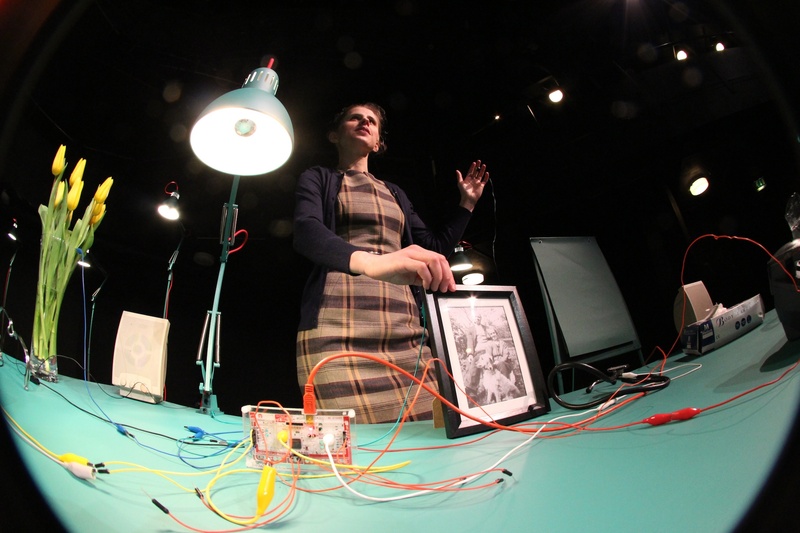 We also used sound as the medium through which to recreate the experience of brain surgery. This involved research and sound recording inside hospital operating theatres and the use of binaural sound, delivered via headphones, to create an intimate and personal experience for each audience member. The show opened in the Studio at Bristol Old Vic in February and will be touring in March and May to venues in Cambridge, Manchester, Birmingham, Norwich, Wolverhampton and London. Full details are available on the Kindle website. In the heart of a bustling city, a wealthy recluse hides behind a barricade of bolted doors and blacked-out windows. His only companion is a private nurse, entrusted with taking care of him. I am very excited to be working with Little Earthquake on their new adaptation of Edgar Allen Poe’s ‘The Tell-Tale Heart’. I will be sharing the stage with the actor Laurence Saunders creating live foley sound effects as he recounts Poe’s dark and gripping tale of murder in the dark. The show will be touring from the Autumn into Spring 2014 with several bookings already confirmed including Salford, Derbyshire and various venues in the Midlands. You can find more info and booking details on the Little Earthquake events page.